Furniture rack storage with UNARCO cantilever is versatile with no front vertical obstructions to damage furniture. Cantilever Furniture Rack is perfect for furniture storage because of its versatile design. Long length items such as sofas can be removed with no frontal obstructions to maneuver around so odd-sized and bulky items fit easily into cantilever rack. UNARCO roll-formed cantilever furniture rack is a solid one-piece column design with a completely welded base construction to provide the strength and durability your furniture warehouse requires. Cantilever arm length can vary depending on the depth of furniture being stored. Wedge-type connectors maintain the arms position with rigidity. Cantilever rack guide rails are available for quick and easy operation from order pickers so upholstery is not damaged by lift trucks. UNARCO’s furniture rack is durable and installation is a snap with the welded one piece cantilever column and base. Cantilever rack arms are locked into the cantilever column in the down position before the entire furniture rack system is lifted into the up position and installed in its storage location. UNARCO offers options for cantilever decking to make sure furniture is not damaged and stays on the shelf. Cantilever rack can easily be converted from single-sided cantilever to double-sided as your furniture storage needs change. UNARCO furniture rack can store any size furniture you need and is versatile and easy to load. Add-on accessories are manufactured to help protect your furniture rack investment. Cantilever rack aisle guards are available in roll-formed or structural steel options to protect the furniture rack as well as the furniture being stored. For more photos of furniture rack view UNARCO Cantilever Photo Gallery. 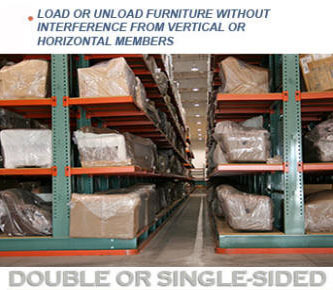 Long aisles of furniture rack cantilever with no vertical obstructions for unlimited furniture storage.